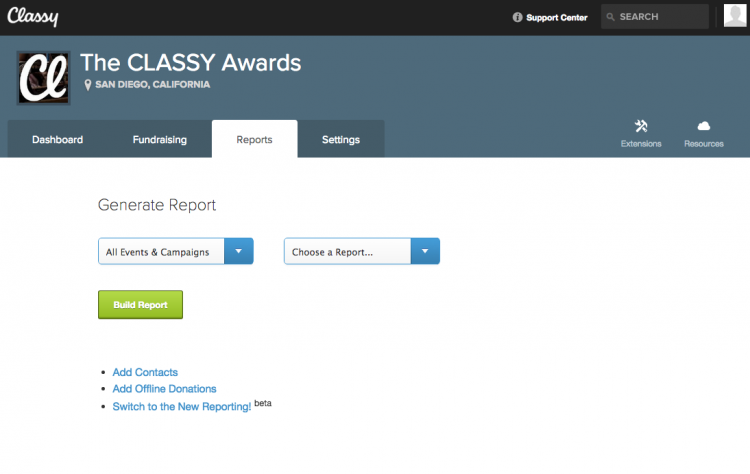 Today, Classy officially launched new reporting. That means we bid adieu to the old reporting forever. Here are a few frequently asked questions that will help you navigate the new reporting and immediately take advantage of its improved features. Why is there a new reporting feature at all? The old reporting got the job done, but it was time-consuming and cumbersome even for the simplest calculations. We knew this wasn’t the ideal user experience. You want to spend precious time focused on their organization’s mission rather than on manipulating spreadsheets. Through research and interviews, we identified several high-impact opportunities to improve reporting for our users. Build reports that are actionable. Make data easier to find, organize, and manipulate. With those goals in mind, we improved the user interface, made it easier to use, added new abilities to summarize data, and consolidated reports. What’s the difference between the old reporting and the new reporting? The biggest overhauls were the interface and the organization of the reports. The new reporting interface gives you a quick snapshot of your organization’s performance. Roll up numbers and averages are displayed automatically; there’s no need to export to CSV just for basic calculations anymore. Don’t worry. Serious data crunchers can still export everything to CSV. Add or subtract filters and columns to manipulate data, right in front of your eyes. When you do export to CSV, you can choose to export all columns or just the ones you’re looking at. This allows you to get the data you need and want, without the noise. Forget wasting time deleting cells in Excel. 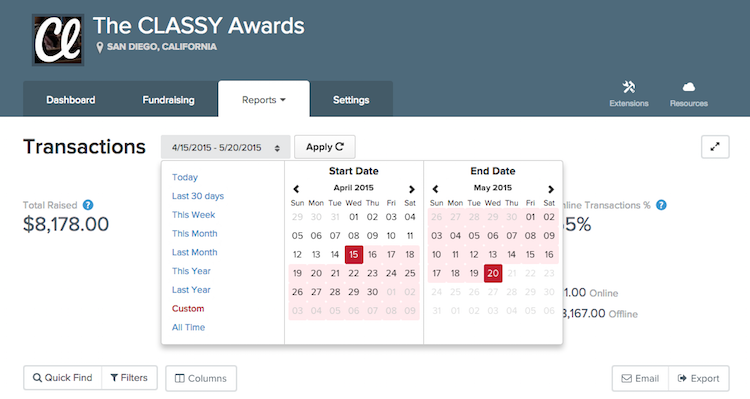 Pro tip: Use the date picker to see snapshots of weekly, monthly, or daily data and get a quick understanding of how your nonprofit is performing in comparison to other time periods. There are far fewer types of reports, but you will still have access to all the data you did previously. The bonus is that the information will be easier to find. I can’t find the report I’m looking for. Did you get rid of it? The Recurring Donors and Recurring Activity History reports are now consolidated into one report called Recurring Donors. Pro tip: Your new Recurring Donors report is automatically sorted by latest activity on an account. Click on the history link to see the donor’s entire history in seconds and without ever leaving the page. 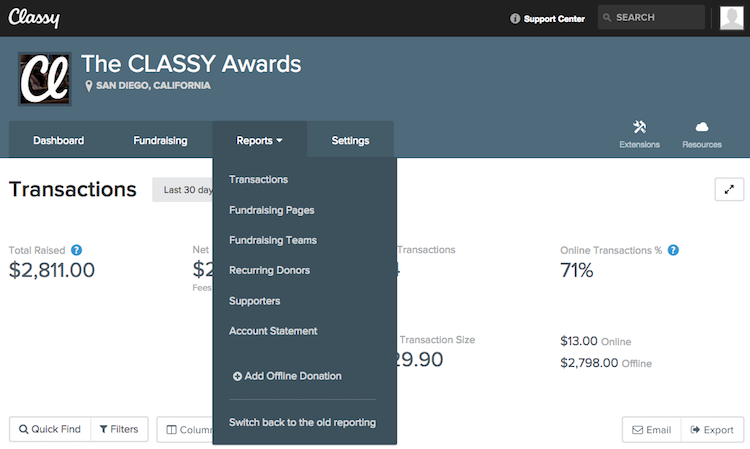 You no longer need to run a separate report to see a donor’s activity history. Great, so how can new reporting elevate my fundraising strategy? Save valuable time and effort previously spent on exporting reports and working in Excel. 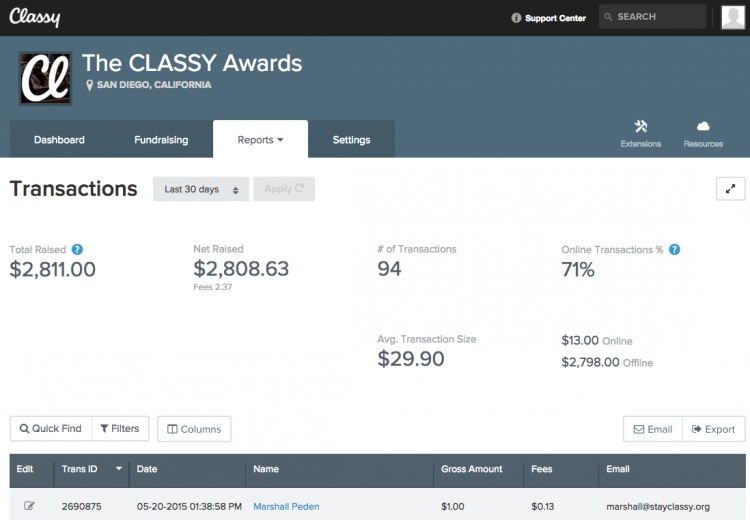 Quickly see performance on a charity or campaign level. The new reporting was built with data-driven decision making in mind. With a more intuitive way to capture, internalize, and act on your organization’s performance, the sky’s the limit. Have a question about the new reporting that you can’t seem to crack? Try our help center or get in touch with our Customer Success team.